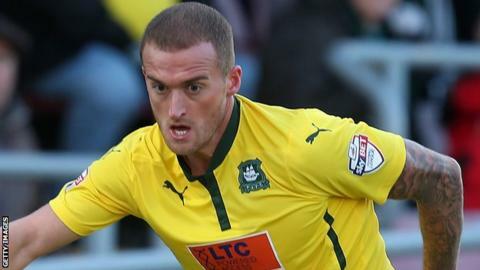 Plymouth beat Wycombe to end the Chairboys' 12-game unbeaten run. A breakaway from a corner provided the first goal, with Lewis Alessandra running free and finishing past keeper Matt Ingram at his near post. Plymouth's lead was soon doubled when Peter Hartley side-footed home at the back post from Bobby Reid's corner. The Pilgrims could have scored more as Olly Lee hit the base of the post and the bar, with Reuben Reid heading over the rebound from close range. The result sees Plymouth leapfrog Bury into the play-off places, while Wycombe move down a place to third following Shrewsbury's late win. "We were poor tonight. We gave two goals away. "Let's take this as a kick up the backside and react on Saturday, that's what I want. "We aren't going to win every game, especially when we play like that. "We had a bad day at the office, there was one or two good things in there, but not many. Not enough to make me smile tonight." Match ends, Wycombe Wanderers 0, Plymouth Argyle 2. Second Half ends, Wycombe Wanderers 0, Plymouth Argyle 2. Substitution, Plymouth Argyle. Oliver Norburn replaces Bobby Reid. Foul by Drew Talbot (Plymouth Argyle). Corner, Plymouth Argyle. Conceded by Joe Jacobson. Bobby Reid (Plymouth Argyle) wins a free kick on the left wing. Substitution, Wycombe Wanderers. Matt McClure replaces Aaron Holloway. Substitution, Wycombe Wanderers. Peter Murphy replaces Marcus Bean. Marcus Bean (Wycombe Wanderers) wins a free kick in the defensive half. Joe Jacobson (Wycombe Wanderers) wins a free kick on the left wing. Substitution, Wycombe Wanderers. Courtney Senior replaces Fred Onyedinma. Corner, Plymouth Argyle. Conceded by Matt Ingram. Corner, Plymouth Argyle. Conceded by Aaron Pierre. Attempt missed. Hogan Ephraim (Wycombe Wanderers) right footed shot from outside the box is too high from a direct free kick. Bobby Reid (Plymouth Argyle) is shown the yellow card.